MR Online | What’s Wrong with Tort Reform? What’s Wrong with Tort Reform? Given the absence of criminal penalties for corporate misbehavior, society needs an alternative means to protect itself against corporate abuses. Ideally, effective regulation might help to keep corporations in line, but the regulatory structure in the United States is embarrassingly weak. Part of the problem reflects the political organization of the United States. The framers of the Constitution deliberately constructed a fragmented government with limited powers, impeding the creation of effective regulatory mechanisms. In contrast, the governments of Western Europe have stronger and more unified bureaucracies that more actively regulate economic activity. As a result, the European public depends more on the government to handle what in United States must be subject to litigation. In the absence of criminal sanctions or effective regulation, the civil courts represent perhaps the last — and sadly all too often the only — avenue of protection for Americans (Burke 2002, p. 8). With the massive deregulation of business during the last two decades, the need to rely on the courts has become even more extreme. Admittedly, litigation creates an enormous waste of resources. To get a rough handle on the overall economic cost of litigation, one study of 35 countries used the presence of physicians as an indicator of productive labor. The authors found that the more lawyers per physician in a country, the slower growth would be (Magee, Brock, and Young 1989, pp. 119-20). Since the likelihood that a corporation will obey the law depends on the likelihood of potential sanctions, only huge judgments can deter business from cutting corners, even where public safety is put at risk. Reducing the costs that corporations face obviously increases their incentive to ignore legal requirements. For example, Ford never faced criminal charges in the Pinto case. Instead, those who suffered injury or their loved ones could only sue the company for damages in civil court. In an effort to cut off this last avenue of redress, corporate interests loudly complain about the excessive costs of litigation. A frequently cited actuarial study prepared by Tillinghast-Towers Perrin indicates that tort costs rose from $67 billion in 1984 to $152 billion in 1994 (United States Congress Joint Economic Committee 1996; citing Tillinghast-Towers Perrin 1995). The press, echoing the corporate public relations machine, often gives the impression that the majority of these cases involve product liability, but Ralph Nader’s Public Citizen’s Web site reports that this category accounts for only about 400,000 of about 19.7 million civil cases filed annually according to the National Center for State Courts (Conlin 1991; Public Citizen 1998). Michael Rustad, a law professor who reviewed the available empirical studies of product liability cases, reported that each and every one of these studies concluded that punitive damage verdicts are rare (Rustad 1998, p. 54). In addition, he found that “[a] typical defendant in a products liability case is a national corporation, not a small business. The majority of primary defendants assessed punitive damages in medical malpractice cases are corporate defendants such as nursing homes, hospitals or health care organizations” (Rustad 1998, p. 54). The so-called tort reform movement effectively uses expensive (but misleading and sometimes even fictitious) examples to argue against an individual’s right to sue corporations. In fact individuals rarely win their cases and even when juries award individuals huge sums to plaintiffs, they rarely see that much money. Instead, even the Wall Street Journal has reported that appeals or prior agreements between opposing lawyers reduce the actual payment (see Hallinan 2004). Yet, corporations themselves do not hesitate to initiate litigation. Consider, for example, SLAPP (Strategic Lawsuit Against Public Participation) suits designed to intimidate individuals from participating in political activity. Suits between corporations occupy far more of the court’s time than product liability cases do. Both the tort reform movement and the media are silent regarding frivolous litigation brought by corporations. Off in a corner of the Internet, one website does illustrate how businesses bring frivolous lawsuits against one another. For example, the breakfast cereal maker, Kellogg, brought a suit against a local golf course, Toucan Golf, Inc., for having the temerity to use its own name and a picture of an actual toucan on its logo. Kellogg claimed that the golf course violated its imaginary Froot Loops bird, Toucan Sam (see, also, “Kellogg Company v. Toucan Golf, Inc.” in The Cutting Edge Report). The Web site declared Kellog a winner of its annual Dumbass Corporate Lawsuit award, but many other corporations could have had just as strong a claim. Rarely does the public hear about such corporate abuse of the legal system, even though the stakes are far larger in corporate proceedings. The suit between Texaco and Pennzoil is emblematic of the costs of massive corporate litigation. From 1984 to 1988, these two corporate giants battled one another in the courts. Pennzoil initially won a judgment of more than $10 billion, but the ultimate settlement was reduced to a mere $3 billion. In the aftermath of the suit, Texaco’s value fell by far more than Pennzoil’s rose because of the money that the litigation consumed. In addition, the corporations had to devote time and energy to the litigation over and above what the lawyers cost. Not surprisingly, the combined equity of the two firms fell by about $21 billion, many times more than the legal fees incurred in the course of the litigation (Cutler and Summers 1988). Burke, Thomas F. 2002. Lawyers, Lawsuits, and Legal Rights: The Battle over Litigation in American Society (Berkeley, CA; University of California Press). Conlin, Roxanne Barton. 1991. “Litigation Explosion Disputed.” National Law Journal (29 July). Cutler, David M. and Summers, Lawrence H. 1998. “The Cost of Conflict Resolution and Financial Distress: Evidence from the Texaco-Pennzoil Litigation.” RAND Journal of Economics. Vol. 19, No. 2 (Summer): pp. 157-172. Hallinan, Joseph T. 2004. “In Malpractice Trials, Juries Rarely Have the Last Word.” Wall Street Journal (30 November). Magee, S. P., W. A. Brock, and L. Young. 1989. Black Hole Tariffs and Endogenous Policy Theory: Political Economy in General Equilibrium. Cambridge, UK: Cambridge University Press. Murray, Alan. 2004. “Business Elite Vows to Take On Kerry If He Taps Edwards.” Wall Street Journal (6 July). Rustad, Michael L. 1998. “Unraveling Punitive Damages: Current Data and Further Inquiry,” Wisconsin Law Review, No. 1: pp. 15-69. Tillinghast-Towers Perrin. 1995. Tort Cost Trends: An International Perspective (New York: Tillinghast-Towers Perrin). 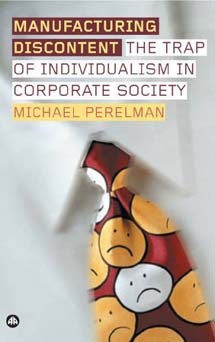 Michael Perelman is professor of economics at California State University at Chico, and the author of fifteen books, including Steal This Idea: Intellectual Property Rights and the Corporate Confiscation of Creativity and The Perverse Economy: The Impact of Markets on People and the Environment. His forthcoming books include Railroading Economics: The Creation of the Free Market Mythology (Monthly Review Press). This essay was adapted from Manufacturing Discontent: The Trap of Individualism in Corporate Society, just published by Pluto Press.